The Sondex spiral heat exchanger is circular with two spiral channels, each in a closed chamber to ensure what comes in also comes out. The flow of the two products being treated is counter-current, which allows for a close temperature approach between them. The heat exchanger's design makes it possible to run free flow on one side and standard flow on the other side. A spiral heat exchanger can treat a solution with a large variety of fluids, such as fouling liquids containing solids and fibers, wastewater, slurries, mixtures with inert gases, cooling and heat recovery, vapor/liquid condenser, and vacuum condenser with inert gases. 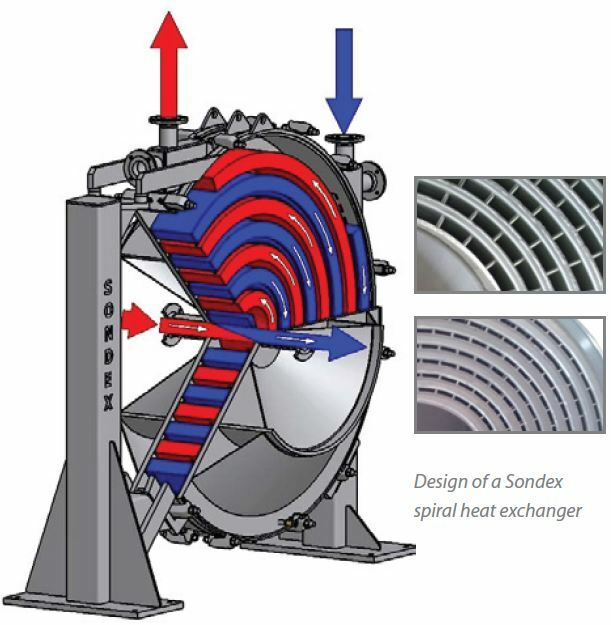 The Sondex spiral heat exchanger provides easy access to the heat transmission area without any special tools. The heat exchanger's side frame provides full access to that side's heat transmission area for cleaning. The side frame is designed with hinges, which makes lifting the equipment unnecessary. As an extra feature, the flexible pipe connections make it possible to run CIP cleaning through the installation, when required. The two gaskets used on the side frames provide for a long lasting solution. Should a gasket need replacing due to wear and tear, Sondex's use of an edge gasket makes this an easy update. Since spiral heat exchanger application and duties vary, all Sondex spiral heat exchangers are customized to customer specifications. 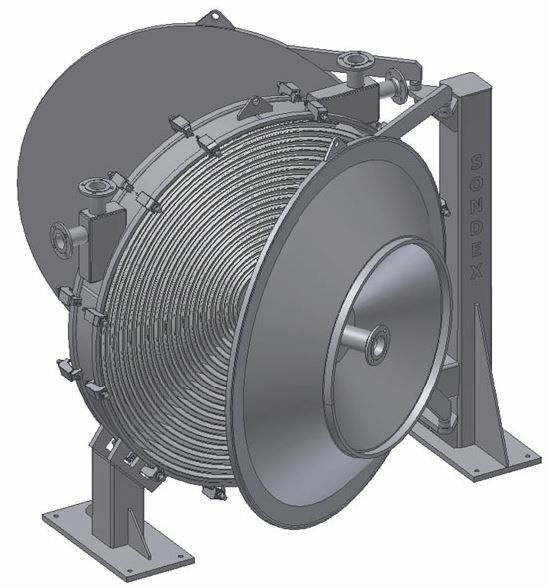 The spiral heat exchanger is a compact solution. The design uses a smaller installation space than traditional heat exchanger solutions, which saves valuable production space and cost.